In Taiwan’s local elections held on November 24, the Kuomintang (KMT) trounced the ruling Democratic Progressive Party (DPP). Common in post-election reporting was the idea that cross-strait relations, one of the traditional defining issues in Taiwanese partisan politics, was less of a factor in determining voters’ decisions than in previous years. According to some experts, DPP President Tsai Ing-wen’s inability to combat stagnant wages, reduce unemployment, and enact labor reform were the principal contributors to her party’s “stunning” loss. These commentators have made it a point to distinguish “China issues” from domestic, economic issues in determining the election outcome. Missing from such arguments, however, is consideration of the underlying and ever-present influence of China on the Taiwanese economy. Although local grievances toward DPP economic policy were the resounding driving force behind the KMT’s victory, Chinese policy cannot escape implication with regard to Taiwan’s ailing economy. Since Tsai’s election in 2016, Beijing has responded to Taipei’s refusal to recognize the 1992 Consensus and the DPP’s pro-independence leanings by choking the island’s economy and exploiting its vulnerabilities and dependence on mainland markets. It is in this way that Beijing, on the local level, indirectly enabled the DPP’s defeat last year. Cross-strait connections established after the diplomatic thawing of the late 1980s have proven a double-edged sword for Taiwan. On one hand, increased trade and transportation across the Taiwan Strait have granted Taiwanese businesses access to mainland China’s massive consumer and aviation markets. On the other, Taiwan has developed an economic dependence on the mainland: China and Hong Kong are Taiwan’s main export markets, accounting for 26 percent and 14 percent of all exports in 2016, which makes Taipei particularly vulnerable to downturns in cross-strait relations. Having gradually established trade relations over three decades, the Chinese government is discovering its impressive leverage over Taiwan’s economic climate, which has manifested itself in two broad tactics of economic coercion used since Tsai’s election: poaching Taiwanese talent and limiting tourism. Since 2016, Beijing has redoubled efforts to attract talent and investment from Taiwan. On February 28, 2018, the Taiwan Affairs Office unveiled a package of 31 incentives to entice Taiwanese people and businesses, offering tax breaks, subsidies, grants, and promises of involvement in infrastructure and development projects. In September, Beijing began offering residence permits with multiple employment, housing, and medical benefits to thousands of Taiwanese. These incentives to draw Taiwanese investment across the Strait add to previous policies aimed at wooing young talent from Taiwan. Following the establishment of cross-strait trade and business ties in 1989, China has moved up the value chain in industries where Taiwan historically held a competitive advantage, namely the information technology and high-tech manufacturing sectors. This has affected wages and employment in Taiwan: Chinese competition in high-tech manufacturing – coupled with Taiwan’s high cost of living and inability to establish household-name, consumer tech brands like South Korea’s LG and Samsung – has driven skilled workers and many businesses to China. Many of the economic woes felt by voters this year, therefore, have been exacerbated by Beijing’s targeted incentive programs intended to outcompete Taiwan. Also prevalent in China’s arsenal of economic leverage are its tourists. When relations between Beijing and Taipei were good, Taiwan reaped tangible gains from Chinese tourists, on which the island’s tourism industry heavily depended. In 2015, 4.2 million mainlanders visited Taiwan, making up 40 percent of all tourists and contributing to the $44.5 billion industry, which is worth 8.2 percent of gross domestic product (GDP). Following Tsai’s election in 2016, however, Beijing’s National Tourism Administration allegedly ordered tour groups to cut trips to Taiwan, a diplomatic weapon it has previously deployed against South Korea and two of Taiwan’s diplomatic partners: Vatican City and Palau. A year after these alleged actions, Chinese tourists dropped to 2.7 million, making up just 25 percent of all tourists; Taiwan’s tourism industry shrank to $24.4 billion (only 4.3 percent of GDP). The implications of these Chinese actions against Taiwan are important. Moves to incentivize brain drain and cut tourism demonstrate how Beijing has used and may continue to use its large economy to implement its greater goals. Although one tactic offers rewards while the other is punitive, both serve to diminish the strength of Taiwan’s economy. If Beijing were to perceive that such tactics were successful in sowing anti-DPP sentiment, the election results may bolster Chinese economic assertiveness on a larger scale. Leveraging its economic might to steer smaller economies’ politics to align with Beijing’s interests may become a more frequently used policy tool. 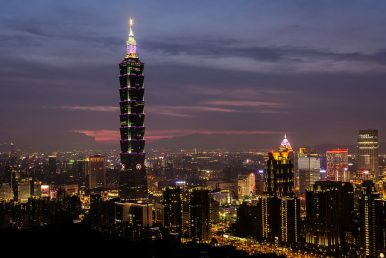 Taiwan, in this way, is a prime example of the interconnectedness of politics and economics, as well as the economic leverage Beijing is willing to lean on when it comes to its core interests. There are early indications that China does claim victory in having used its economic power to appeal to the Taiwanese public and that it may continue re-energized in its use. Just four days after the election results were reported, the Taiwan Affairs Office used the losses of the DPP in Taiwan’s south to propose newly feasible cross-strait urban exchanges. The office even used Mayor Han Kuo-yu’s upset win in Kaohsiung to informally promote tourism to the southern port city, historically a DPP stronghold. Bold moves like this direct appeal to traditionally pro-DPP local constituencies underscore the importance of Taiwanese policies like the New Southbound Policy, which seeks to diversify Taiwan’s economic, trade, and tourism partners, resist the draw to become more reliant on the massive Chinese market, and strike a balance between growth and security in international economic relations. While cross-strait relations did not play a direct role in Taiwanese voters’ choices – a 2018 Mainland Affairs Council poll showed 84 percent of Taiwanese support Tsai’s status quo approach – election analysts would be neglectful to discount China’s indirect and ever-present impact on Taiwanese politics. Given China’s economic draw, it is important to remember that the “China issue” is entirely inseparable from the Taiwanese economy and, therefore, politics. China’s economic influence on Taiwan’s electoral process – albeit indirect – should not be downplayed in post-election discourse, particularly as Taiwan gears up for its presidential election next year. In an era when the world’s second-largest economy is coming to terms with new ways of asserting its interests, understanding the full arsenal of Chinese foreign policy tactics will prove essential to the international community as it seeks to counter coercive diplomacy. Jason Li is a Research Assistant with the East Asia program at the Stimson Center. His research focuses on U.S.-China relations, cross-Strait relations, and grand strategy in Asia-Pacific. He holds a B.A. from McGill University where he graduated with first class honours in Political Science.